The lodge was in the old Wildmere Hotel. Perched on a cliff overlooking Lake Minnewaska, Wildmere had been a graceful example of the grand nineteenth-century wood frame resort hotel. But by 1980, it was a tumbledown shadow of its former self. It had been closed to lodgers, most of the furnishings auctioned off. Pieces of old furniture blocked staircases because the upper floors were unsafe. In a formerly imposing drawing room at one end of the ground floor, one could buy trail passes and rent skis. In the middle of the long main hall, two wax rooms afforded fabulous views of Lake Minnewaska. At the far end of the building, another drawing room was a snack bar. The heating was exclusively via cast iron stove. Locals looked on approvingly as my friend Barclay heated wax into our skis with a propane-fired iron. From the lodge, we set out down Library Hill, a short steep downhill ending in a T intersection next to the eponymous lake. I can’t tell you how many times I fell at the bottom of that dopey hill before I finally got the hang of it. I learned to turn on the job so to speak, and learned to love going uphill because it was harder to fall. From the base of Library Hill, multiple trails lured you into skiing all day. In those days, we wore parkas, knickers, and gaiters and carried lunch on our backs. The occasional plunging downhill or technical dogleg corner punctuated long carriage roads with easy grades. The forest was a unique mix of stunted pine trees interspersed with mountain laurel, emerging out on to cliffs with awesome views. Castle Point, for example, was an exposed, rocky outcrop. Invariably windblown, it held snow with difficulty. You’d take off your skis to walk across a few meters of gravel. It didn’t matter, because on a clear day you could see clear to New York City. Minnewaska skiing opened a new world of all the possibilities of outdoor adventure. The first time I skied Hamilton Point, it was snowing two inches an hour. We slogged through new snow with the wind screaming in near whiteout. We’d passed the Millbrook Mountain trail, but otherwise, the weather had us disoriented. Should we turn back? Had we gone off the trail? Maybe there was a vestigial ski track, or maybe it was just the way the trees framed the landscape. But I saw the trail and shouted, “It goes! It goes!” I felt like Roald Amundsen discovering the South Pole. That one day did more than anything to fuel my desire – no, my need – to get outside. Although we occasionally skied Mohonk back then, we preferred Minnewaska. A few years ago, I happened to ski Mohonk again and became a convert. Like my first day at Minnewaska, that return to Mohonk was on a stellar day. Bluebird skies combined with intelligent grooming won me over. The trail system did too: If I want an easy cruise, the west side of the trail system, closer to the hotel, offers long, sinuous trails with gradual up and down. When I feel the urge to beat the crap out myself, I’ll ski from the bottom of Spring Farm Road up Guyot’s Hill as many times as I can until I stagger back to my car. From Huguenot Road, the southern ramparts of the Catskills loom. 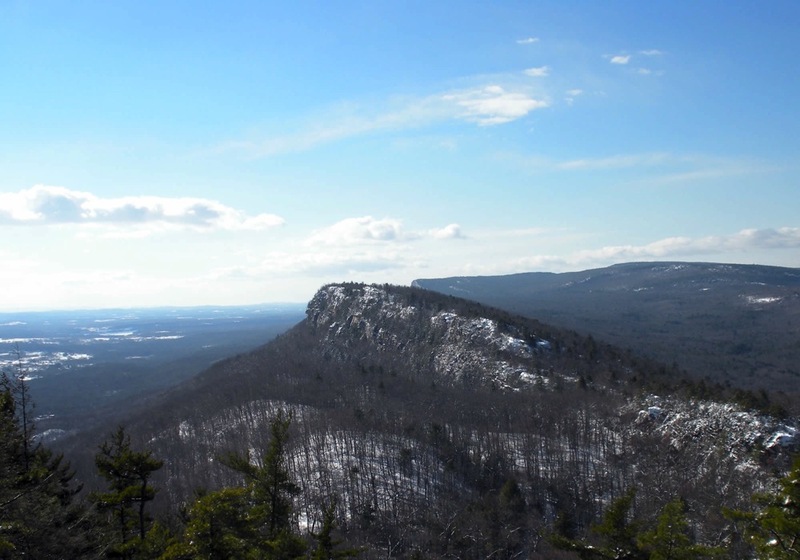 From Skytop, the high point of Mohonk’s property, the same stupendous views are available as from Minnewaska. The scenery is equally magnificent to Lake Minnewaska, with the added benefit of better grooming. I’m now a member of Mohonk Preserve and I’m looking forward to many hours skiing there this winter, as well as running during the summer. 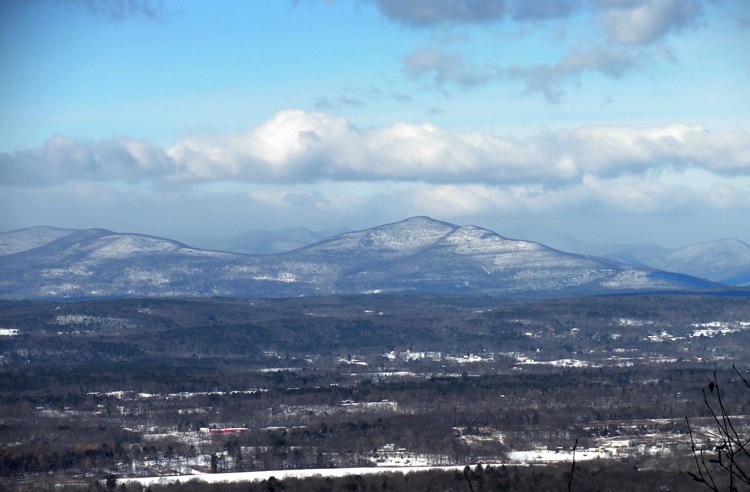 My love for Minnewaska and Mohonk has inspired me to attempt a history of the two ski areas. Because much of Minnewaska’s story is readily available, the history is slanted towards that side of the story. By contrast, there’s a stark paucity of information on Mohonk. Harvey and I have been unable to contact the curators of Mohonk’s history. Should those curators read this note, I respectfully request the opportunity to meet with you and view whatever information you can make available, so this can be a complete history of skiing in Ulster County. I like to mountain bike the Minnewaska trails in the fall once on a nice Sunday. Lot’s of fun, not super challenging, (which means you can bring almost near novice biking friends with you) and spectacular scenery at times. One of the mountain biking trails is down a gentler ski slope that I think was right at the base of the old hotel which is no longer there. Lots of fun, and, highly recommended. You can experience the place with a good pair of hiking shoes, too. Just watch out for Benny on the downhills. What I still don’t get is how the Mohonk Mountain House is still able to charge so much for a room these days. Who stays there, royalty and hedge fund managers? Benny, your question is one of the keys to why Mohonk survived and is thriving today. I believe that positioning themselves as a super-premium destination is part of the reason Mohonk is still in business. However, that thesis requires a lot more research. There’s mountain biking at Mohonk Preserve also. You’d have to check the web site, I don’t know which trails are allowed. Best trail head would be Spring Farm. Yes, Mohonk does very well catering to the Wall Street and NYC Old Money crowd. Try finding a room there under $600 a night, good luck with that. Despite everything we hear about the economy being in shambles, there are plenty of people who can afford these kind of prices. Oh, and if you just want to go and look at the view over the Hudson, last I heard it was $25 just to get into their parking lot and look around the resort. Really. I wouldn’t doubt it. The only time I parked there was in ’96 or so, and that cost us ten bucks. I’m just jealous. Awesome hotel, and would love to stay there. Peter’s reminiscence defines the essence of cross-country skiing. Well done, sir! I’ve seen several Mountain Biking reports from Minnewaska, but as of yet we’ve haven’t post a winter report from either Minnewaska or Mohonk. Maybe this will be the winter? I agree with SBR – Peter’s writing is magnetic. Click through to the History too – it’s also very well done. As Peter mentioned, if anyone has more information or images to supplement the history of Mohonk, please reach out to one of us. For winter conditions reports, one might consider joining Mid Hudson Cross Country Skiers (mhxccs) newsgroup. Among others, the Mohonk grooming crew periodically posts on when/where they’ve groomed. The gunks are so special, what is crazy is that they are so renowned for the climbing, which nets you some views but such a miniscule amount of the overall environment. I really don’t think climbers care much about being outdoors. Case in point, the many dozens of climbs in the dacks and greens they won’t do because of the hike in. Gotta belay from the car! But, that does mean more glacial lakes for us! Wow Peter, this was a cool experience and I’m sure you must have really thanked your friends who dragged you to minnewaska..
ML242, it sounds like you hang out in a different circle of climbers than the ones I know. Almost without exception the many climbers I know are avid hikers, paddlers, xc and bc skiers, cyclists, backpackers, mountaineers. Your claim that “climbers don’t care much about being outdoors” makes about as much sense as saying skiers don’t care much about being outdoors because they only visit mountaintops that they can reach via mechanical lifts, and descend on bulldozed trails with artificial snow and machine-groomed surfaces. Gotta be able to walk from the car to the chairlift! The behavior I have observed has been really really weird and eye opening. I realize that I painted that picture with a broad brush…. just what I’ve observed in talking to many people in the climbing gym. Peter- Have you ever done any XC at Fahnestock? Are the trails notable? Did you rent, how abysmal is the stock? Looking forward to getting on some skinnies for the first time ever this winter. @ ml242. I’ve skied Fahnestock many times, although I haven’t been in the last 2 years. The manager, Paul Kuznia, is dedicated and is totally into xc skiing. Trails range from easy to challenging. I wouldn’t want to go down the Otter Slide on an icy day. There’s enough there to keep me entertained for 3 or 4 hours when there’s enough snow. Paul has a newsgroup where he posts conditions, but I don’t recall the name at the moment. My quiver is all cross-country, so I don’t rent and can’t comment on their rental fleet. Hudson Valley Resort & Spa is an affordable alternative to staying at Mohonk. It’s close to Minnewaska.